Many times, you might find that MyShoppingPal.com expert's recommendations contradict with your choice. For example, you might find that according to the experts’ advice, full sleeved dresses work well for you. But if you just don't like wearing full sleeves, you can bias the results towards your personal choice by training the MyShoppingPal.com engine about your preferences. Indicating your preferences takes not more than a click! For this purpose, we have provided “I like it” and “I don't like it” buttons for each and every product in every department. For say, if you liked these shoes, then you can indicate your preference by clicking on “I like it”. And then you can be more specific by selecting those particular attributes which attracted you to these shoes. These attributes can be anything from the shoe type, shoe style, toe type, color, to material type. Similarly you can indicate your dislikes too through “I don't like it” button. This way the MyShoppingPal.com engine learns about your preferences and next time it shows the products which go as per your choice. If you continue to specify your likes and dislikes, the intelligent engine will learn more and more about you and it will show the results which not only work for you but also go well with your style and preferences. So, with the interesting combination of expert advice and “preference indication”, you can get the best of both worlds. Products which you like and work well for you too! MyShoppingPal.com is your best to place buy clothing, bags and men and women's shoes on sale. Please try our personalized search to find your perfect item at the best price. You will find the best deals and sale events from all stores on the Internet. Similar to clothing, the MyShoppingPal.com FAP score for jewelry also takes into consideration “looking good factor”, your personal preferences, and fashion trends to determine the suitability of an item for you. In addition, the FAP score for jewelry pays special attention to the quality of the jewelry and what is the market value of the jewelry. Our gemologists have incorporated extensive knowledge about precious stones into the FAP score system to make it analyze the quality of jewelry and its market value. When you are spending on an exquisite piece of jewelry, the thing that matters most is the quality of gems and metals used in the jewelry. And most of the times, we end up paying more than its worth because hardly anyone of us knows how the various properties of gems like it's colorless degree, clarity, cut type etc determine its original cost. Along with the price calculation, these properties determine the genuine quality of gems and stones. MyShoppingPal.com gemologists can make things lot simpler for you by providing all this information on a platter for each and every piece of jewelry. 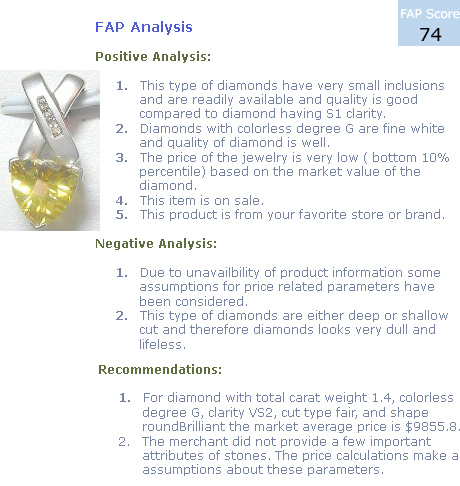 For example, the picture above shows the FAP analysis and score for a diamond pendant. The FAP score of 74 indicates thisdiamond pendant will work well for you. As indicated in the positive analysis, this pendant is of decent quality due to the colorless degree of diamonds used. But these diamonds lag behind in terms of cut which can affect the quality slightly. 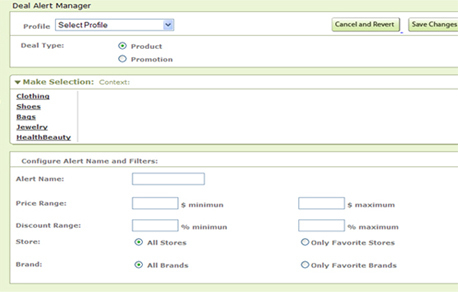 The user's preferences regarding particular stores and biasing towards sale items have also been taken into account. The recommendations depict the price calculated by evaluating distinct properties of diamonds and carat weight of any metals if used. The knowledge of world known gemologists has been incorporated into MyShoppingPal intelligent shopping engine to evaluate the quality of price of the jewelry. If the price of the jewelry is found to be more than the calculated price then we clearly indicate that in the negative analysis section while a comparatively low price is indicated as a positive aspect. There are times, when for a particular piece of jewelry, merchant doesn't specify all the values needed for price calculation. At that time our gemologists make quite a few assumptions based on some other factors which can affect the accuracy of the calculated price so we indicate this as a negative aspect of the item. MyShoppingPal.com is your best to place buy jewelry, men & women boots, clothing. Please try our personalized search to find your perfect item at the best price. You will find the best deals and sale events from all stores on the Internet for shoes, boots, jewlry, and clothing. Similar to clothing, the MyShoppingPal FAP scoring for health & beauty items takes into consideration “looking good factor”, your personal preferences, and fashion trends to determine the suitability of an item for you. In addition, the knowledge of world renowned cosmetologists about the benefits and side effects of various elements have been incorporated in MyShoppingPal intelligent shopping engine. The FAP scoring uses this knowledge to figure the quality and side effects of an item for you. 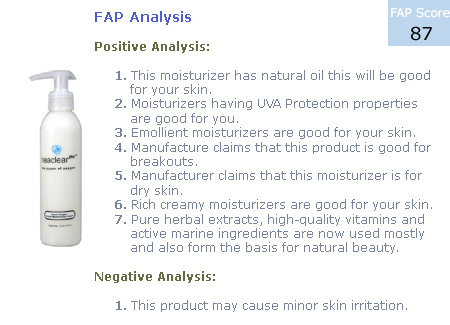 This FAP analysis depends on the skin type, skin problems, lip type, lip problems, nail problems, and many other body parameters. Many of these parameters are included in your advanced profile, so don’t forget to complete this section before shopping for health & beauty items; otherwise the system will not be able to figure out the suitability of an item for you. With the market being flocked with so many health & beauty products, it leaves the consumer more confused. Out of the heap of products, how do u find the right product for you? Do you ever look at the ingredients list given on the cover? Even if you do, are you aware of the effect of these ingredients on your skin type or hair type? And you need to be more careful, if you have got some skin problem as many times these products end up exaggerating the problem. So the better way out is to take recommendations from a beauty expert/ cosmetologist as it's not worth taking a risk where your beauty is concerned. To find out how shopping for cosmetics gets easier with the help of MyShoppingPal.com cosmetologists, consider this moisturizer which is recommended for a woman with dry skin and breakout problems. As the analysis section indicates, the skin of the user and each and every ingredient of the moisturizer is being analyzed properly. The emollients, natural oils, and rich creamy properties make it suitable for dry skin, while some other ingredients take care of breakouts. Apart from the suitability, the preferences of the user with respect to brands or stores are also very well taken care of. Any sort of side effects the product is likely to cause are listed in the negative analysis section. As for this moisturizer it might cause minor skin irritation. MyShoppingPal.com is your best to place buy health & beauty,clothing and shoes. Please try our personalized search to find your perfect item at the best price. You will find the best deals and sale events from all stores on the Internet. If you are looking for regular or designer shoes, or dress for your prom, please check MyShoppingPal.com. Similar to clothing, the MyShoppingPal FAP score for shoes also takes into consideration “looking good factor”, your personal preferences, and fashion trends to determine the suitability of an item for you. In addition, the FAP score for shoes pays special attention to the comfort and feet problems for the user. How many of us actually know about the properties of shoe materials? And how many of us care to find out the various characteristics of shoe design and material which can exaggerate our feet problems? This is where we need the help of experts who can suggest us the right shoes based on their knowledge and our requirements. The extensive knowledge about what type of shoes are good for what type of feet problems and the comfort qualities of shoes has been incorporated in MyShoppingPal.com FAP scoring system. MyShoppingPal FAP score for shoes depends on the answer to many questions such as feet problems, arch type, ankle type, feet type, etc. These questions are in the advanced section of your profile. Please don’t forget to complete this section before shopping for shoes; otherwise the system will not be able to figure out the suitability of an item for you. 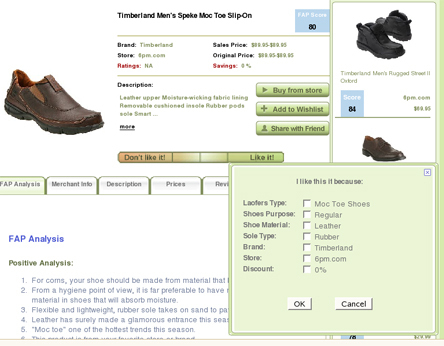 The Myshoppingpal.com FAP Scoring for shoes is illustrated by the example in the picture above. The Oxford shoes with a FAP score of 70 work well for the user. The given FAP analysis reflects the reasons for it. 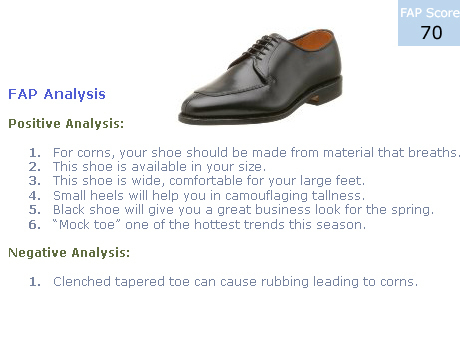 The user has the problem of corns, which requires oxford shoes that provide proper ventilation. The small heels of the shoes also help to camouflage the tallness of the user. The wide design can accommodate the large feet of the user comfortably. Along with the benefits of material, the moc toe design makes it a trendy item. The clenched tapered toe of the shoe may exaggerate the problem of corns so that aspect is also reflected in the negative analysis. MyShoppingPal.co also has huge inventory of shoes from all stores for name brand shoes such as Nike Shoes, UGG Boots, Ecco Shoes, etc. You will also some of the best deals for name brand and designer brand online shoes. The MyShoppingPal.com FAP scoring system combines fashion and expert knowledge with user’s preferences to rate the items for you. The score that is presented to you for an item is the personalized score for you. This score is different for different people. One of the key components that go in the FAP score for clothing is whether an item will look good on a user or not, which we also call “looking good factor”. Based on his body characteristics and style, the fashion expert's knowledge and recommendations are used to figure out the “looking good factor”. This analysis does not assume a few types of body types and comes up with simplistic recommendations. Most of the prior work that has been done in this arena relies on 4-5 body types to figure out what looks good on you. For instance, Kendall Farr in her book “the Pocket Stylist” defines 6 body types: A, B, C,D,E,F. Clinton and Stacy in their book “Dress Your Best” define 18 types for Women and 8 body types for Men. Instead of pigeon holing people in a specific body type, MyShoppingPal.com has built a model which is more flexible and takes into consideration all the body characteristics of people. We consulted a few dozens fashion experts and referenced the work done by all well known fashion specialists to build this model. An extensive user testing has been done to test the model. While the focus for adults is on “looking good factor”, for kids we give equal weight to “looking good factor” and “comfort factor”. The second component of the FAP score for clothing is the personal preferences of the user. We take into consideration the preference information which user provides while creating his profile. In addition to this data, the user has ability to continuously train the system what he likes or dislikes while shopping for a specific item. The third component of the FAP score for clothes is the fashion trend suitability of an item for a given personal style. Our fashion specialists constantly monitor the trends and incorporate it in the system. We don’t club all trends into one bucket. Our specialist analyze the trends and figure out what trend works for which personal style and incorporate this knowledge in the system. It is imperative for the user to provide accurate information about his body characteristics such as chest size, height type, waist size, etc while creating profile her/his profile so the system can use expert’s knowledge into figuring out what will look good on you. The basic section of the profile will allow you to shop with FAP score, but if you want more detailed FAP analysis you should fill in the advanced section of your profile. So if you want to buy say a women top, the FAP scores will tell you what type of top works well for you from body type, complexion, personal style and trend point of view. Small little details of a top such as its fabric, color, neckline, sleeve type and fit type etc. are considered while determining its suitability for you. For example, a FAP score of 70 for this women top displayed in the picture shows that it is a good option for this user who is curvy but has a big tummy. The soft and low elasticity fabric, empire waistline and sleeveless design go according to her body type. Along with the body type, other details of the user like tummy type, arm type and bust type have also been taken into account while deciding the suitability of this top for the user. The positive analysis shows which features of the top work in favor of the user and why? The negative analysis talks about the contradicting features. These positive and negative features together contribute for the score of 70 for this women top, Along with being suitable according to body type and clear cool complexion of the user, the user can immediately guess that a tunic , with empire waistline makes is a trendy item too. MyShoppingPal.com is your best place to find sale on name brand items such nike shoes, reebok shoes, levi jeans, ugg boots. You will also find huge variety of name brand and designer brand online shoes and clothing. If your friend also has a profile on MyShoppingPal.com, you can make the most of this opportunity to buy gift for him/her. You can ask your friend to share his/her profile with you, so that you don't have to go through finding out all the little details about him/her and build a profile for him/her in order to shop for him/her. This will make buying gift for your friend more convenient and there are no chances of you going wrong in finding the “right gift” for him/her. The procedure of sharing profile at MyShoppingPal.com doesn't even take a minute. First, please go to the Profile Manager page by clicking on “edit profile” button at the right top of any screen (You need to be logged in to see this page). You will see a "Share with Friend" button right at the top. Click on it, it will open up a form. Fill in the email address of your friend, the name (nick name) that you will refer him with, and the type of sharing. If you select the sharing to be intimate, you and your friend will be able to see the FAP analysis for each product. On the other hand, the regular sharing only shows you the FAP score. So depending on the level of comfort level with your friend, please pick the right option. Once thing to keep in mind, the sharing of profiles is mutual. When you send or approve the sharing request, your friend will get access to your profile and you will get access to your friend’s profile. The best part about sharing your profile at MyShoppingPal.com is that even when your profile is shared, your details won't be visible to your friend. We respect user's privacy regarding his/her vital statistics and problem areas, so the details filled up by you will be visible to you only. In maintaining the privacy, we go one step ahead and give user the option to either make his/her FAP analysis visible or hidden to the friend. As FAP analysis may give your friend an idea about your personal details, you can keep them hidden. But if you are not that secretive about your details then you can make them visible which will help your friend better understand the suitability of the product for you, while buying gift. MyShoppingPal.com is your best to place buy clothing, and shoes. Please try our personalized search to find your perfect item at the best price. You will find all top brand apparel as well as designer shoes on sale. MyShoppingPal.com allows you to monitor a product deal or promotion deal. You can create an alert for a deal by filing up a simple form. Once you create an alert, you can see the latest deals related to the alert in your deal box. This feature is available only when you login. MyShoppingPal.com supports moniotoring of two types of deals: Product and Promotions. The Product deal allows you to specify the product on which you would like to receive the alerts. You can pick the profile, type of product, and its various attributes. The Promotion deal allows you to specify the department and the type of promotion such as a coupon from your favorite stores or sales event at your favorite stores. To create a deal alert, please click on the “Edit Alerts” button at the top right corner of the page. This will take you to “Alert Manager” screen. On this screen you will see a button “Create New Alert”. Click on this button, it will take you to the form that allows you to create a deal alert. The coupons option is another short cut to have a look at all the coupons being offered at various stores. You can also specify the particular department and store, the way you do while searching for Store Promotions, like a 20% off coupon for men's shoes at Jos A Bank. Once you setup a deal alert, you can view the results in the deals section. Just take the mouse over Deals Button on the MyShoppingPal.com navigator, in the drop down menu you will see deal alert section. Gifting your friends and family members has never been so easy. The way you can enjoy the benefits of creating an account with MyShoppingPal.com, the same tools will help you find the right gift for your friends. When you are set to buy a gift for your friend, the only thing that bothers you the most is “whether this gift will work for him/her?” But, with the help of so many experts in various fields, getting the best out of rest won't be a difficult job for you. The only prerequisite is that you should know few basic details about his/her physical appearance and little bit about their style quotient. This information will help you in building up a profile for your friends which in turn will help the experts search the right thing for them. The more and better you know your friends, the better the results will turn out to be. Building up a MyShoppingPal.com profile for your friends is as simpler as yours. After logging in, you just have to click on “edit profile” at the top right corner of the screen. This will take you to the Profile Manager page. The Profile Manager page has a button at the top “Create New Profile”. Just press this button, it will allow you to create a new profile for your friend. Filling up the basic section is enough to start shopping but if you know your friend thoroughly well, you can go ahead with the advanced section too. Your friend will be amazed to know, how relevant your gift is! MyShoppingPal.com is your best to place buy clothing, and health & beauty, men's shoes, women's boots and shoes. We also collect shoes deals and sale events from all stores to help you find your apparel clothing or shoes in all sizes at the best price. Get the best of the expert's recommendations and personalize the results by joining MyShoppingPal.com and create a personal profile, which requires you to fill up some personal information that will help experts in evaluating the right thing for you. 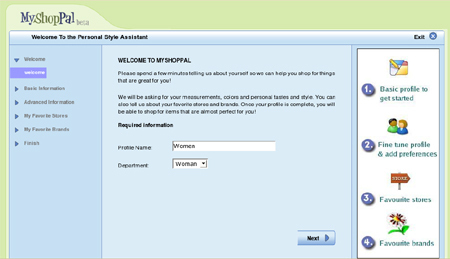 To make sure that you don't have to spend much time and energy in filling up the details, the MyShoppingPal.com profile has been divided into sections like basic information, Advanced Information, My Favorite stores and My Favorite Brands. This classification into sections helps you to build the profile quickly as it gives you the freedom to complete just the basic section which doesn't take more than 3-5 minutes and proceed to shopping. But if you are more particular about getting the best results, then you can spend few more minutes and fill up remaining sections too. The more and accurate information you will provide, the better the recommendations will be and hence it will be easier and quicker for you to access the right product. The Basic Information section which works towards detecting your physical appearance and personal style is the prerequisite for rating of clothing, health & beauty products and bags. The advanced section helps to rate shoes and jewelry products, fine tune the ratings for clothing and health & beauty products, and personalize the results with you preferences. So you need to fill up the advanced section if you want to avail of the gemologist's and shoe expert's knowledgeable advice along with getting even better recommendations from fashion experts. MyShoppingPal FAQ: What is the FAP Score? The FAP Score stands for Fashion, Attractiveness, and Preferences Score. MyShoppingPal.com helps user find what is right for them by calculating a personal score, which it calls FAP Score, for all products. Once you create his/her personal profile, which includes details about your body characteristics, fashion style, and preferences, a FAP score is generated for each item. The FAP Score takes into consideration whether the item is attractive (A) for you, matches with your fashion (F) style, and meets your personal preferences (P). The MyShoppingPal.com attractiveness analysis varies depending on the product category. For the fashion goods, the most important element is whether the items will look good on you. We also call it “looking good factor”. For the technical products, the attractiveness analysis focuses on the technical merits of the product. An extensive expert and fashion knowledge is combined to figure out the attractiveness of an item for the user. The better an item matches the user's body characteristics, style and preference, the higher the FAP score is of the item for the user. This technology works well for all fashion categories such as clothing, shoes, jewelry, and health & beauty items. Since we aggregate products from all stores, we help you find your perfectly matching item at the best proce. You will discover your favorite shoes on sale in your size, or your designer jeans that fits you best on deep discount. For MyShoppingPal to evaluate the FAP score accurately, it is imperative that you complete your personal profile accurately. Join MyShoppingPal.com and experience the shopping in the new era.